June 29, 1999 by David Weisner – R and I read, “June 29, 1999” together. I pointed to and named the gigantic vegetables on each page. R enjoyed flipping through the pages over and over. When I closed the book, she would say “book” and demand to have another read through. This book is a great way to inspire scientific investigation in children. I look forward to reading this book again with her when she is older and we can conduct experiments together. 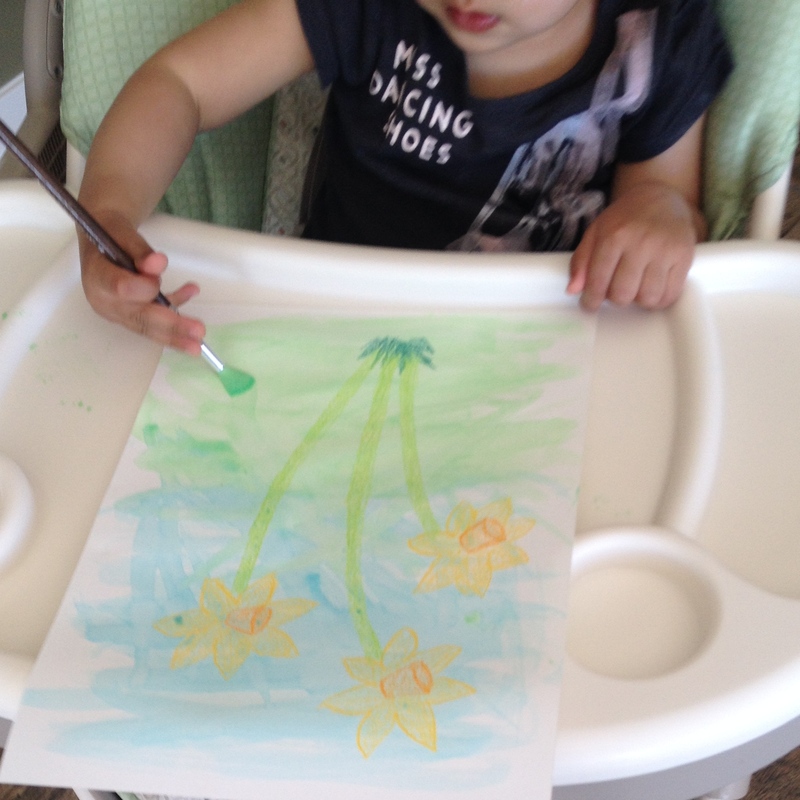 I drew daffodils on watercolour paper with crayon. R practiced her brush strokes using blue and green watercolour paint. She poked at the beaded water that would sit on top of the crayon. Her favourite part of painting is dipping the brush in the paint and she does so with precision. I can really see how much R has improved on her control of the brush and coordination. The more we paint, the better her fine motor skills get! a. Instead of the adult, have the child do the crayon step. b. Discuss why water beads on top of crayon and it doesn’t on top of paper. I made flowers out of pipe cleaners and gave R a dry foam cylinder that I got from the floral department at Michaels. I first helped her poke the flowers into the foam and then she did so independently. I used the command “poke” to establish a connection between the action and word. We counted the flowers after poking them in. R’s favourite part was pulling them back out. a. 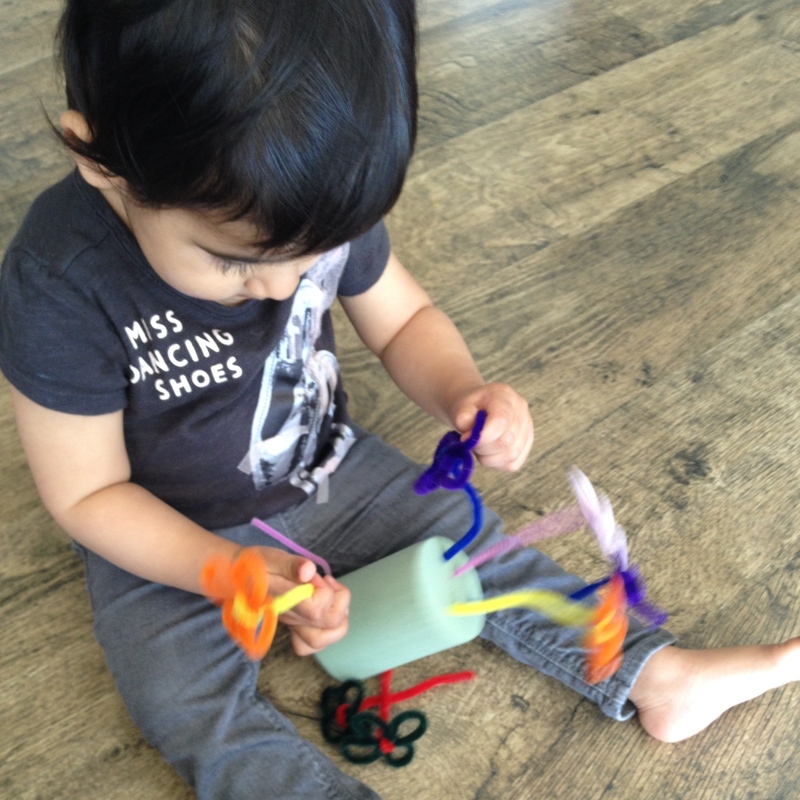 Work on fine motor skills with older children and have they shape the pipe cleaners into flower shapes. Provide the child with photos of flowers so that they may use these as a guide to what a flower looks like. b. Make pipe cleaner flowers in solid colours and work on colour sorting by giving the child multiple dry foam cylinders to sort the coloured flowers into. 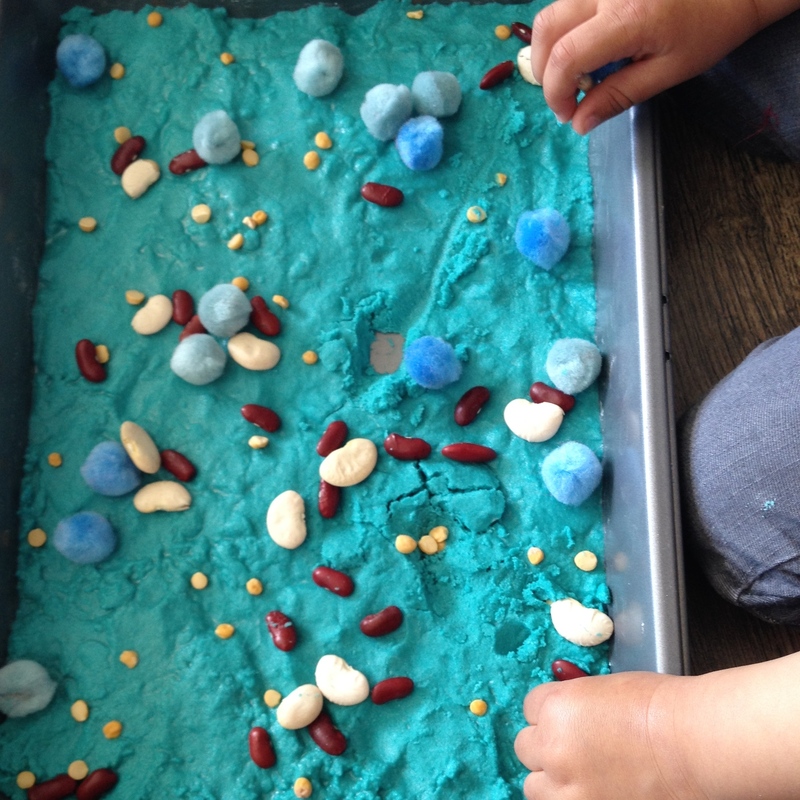 We did a seed collage in Moon Sand instead of our usual go to mouldable dough – play dough. 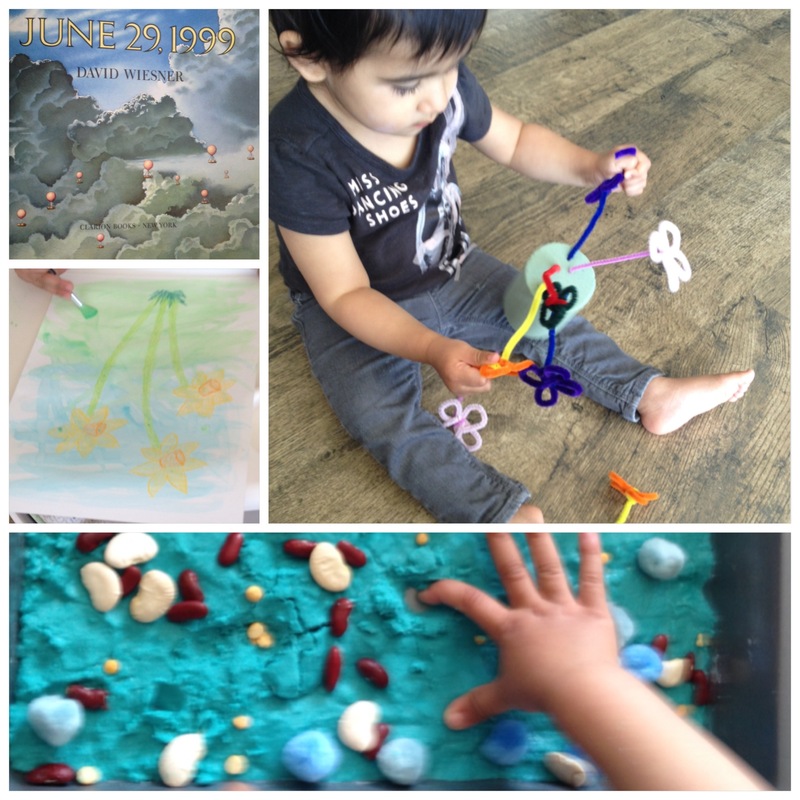 R liked poking seeds and pom poms into the moon sand. She didn’t, however, like the texture of the moon sand as much as she enjoys play dough. a. Have the child be the one to measure and make the Moon Sand.